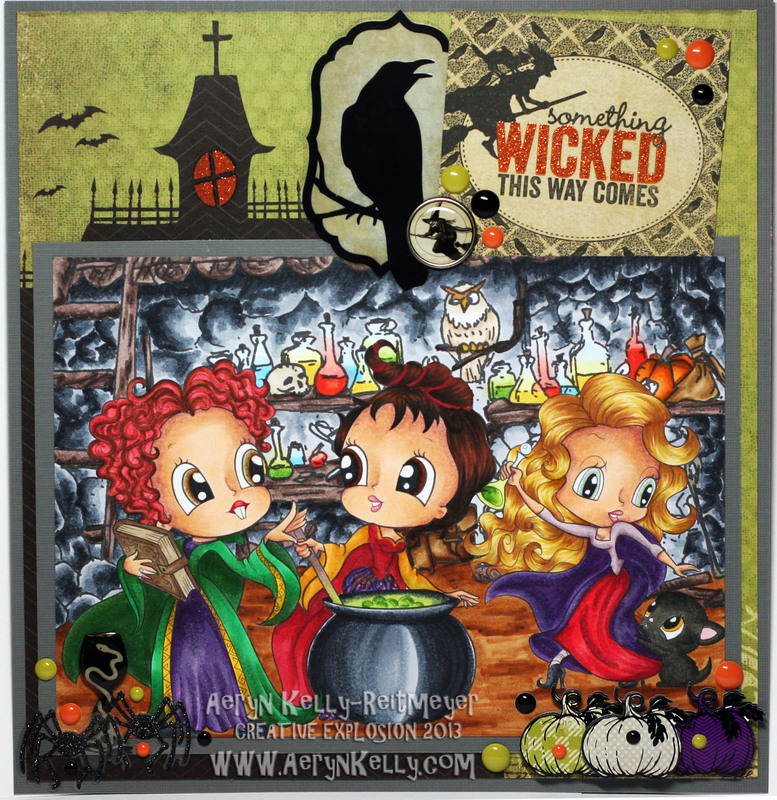 Aeryn's Creative Explosion: Card: It's Just a Bunch of HOCUS POCUS!!! Card: It's Just a Bunch of HOCUS POCUS!!! It's HERE!!!! Halloween is here! Finally! Oh man, this month has been amazing, hasn't it?! So many projects, so many spooks and ghouls and witches and monsters... I had such fun doing 31 projects this month. I HAD to cap it off with the wonderful ladies from the Hocus Pocus movie, Winnie, Mary, and Sarah. I made this scene last year but never got it coloured, too scared/not enough time I guess, but this year I just dove in. I looked up pictures of their real outfits and tried to match as best I could. Then looked up eye and hair colour as well, just to give it that special touch. Even for little Binx there! Hocus Pocus is the be all and end all of Halloween movies for me so this was super fun to do. I'm really happy with how this came out and I hope you are too. I hope you have an amazingly wonderful Halloween. Each and every one of you!